Frederick Wall was born in Charminster, Dorset, on 7 September 1876. He was the eldest of the three children of gardener David Wall (b1856) and Helah Mary née Hawker, known as Mary (1847-1918). David and Mary's children were Frederick, Edmund James (b1881) and Amelia Mabel (b1888). In the 1881 census David, Mary and 2-year old Frederick were living in a cottage in Mudford Road. The complete family were still living in Mudford Road in the following 1891 census. On 28 September 1892 at Stratford, 18-year old Frederick enlisted in the 97th (Earl of Ulster's) Regiment of Foot, although by the time he enlisted it had been amalgamated and re-named 2nd Battalion, Queen's Own (Royal West Kent Regiment). His Service Number was 3490. 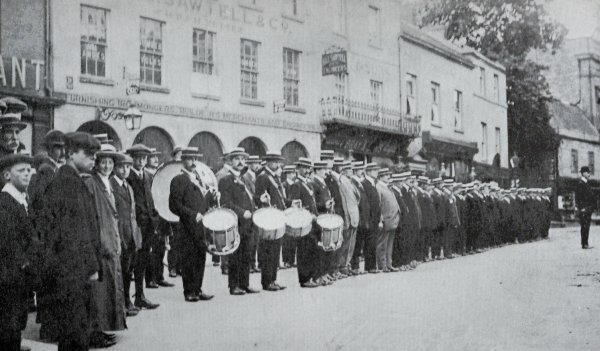 The 2nd Battalion was deployed to South Africa shortly after its formation, in the aftermath of the First Boer War. It was then posted to Ireland and spent the remaining years of the 19th century in the United Kingdom before being sent to Egypt in 1899. 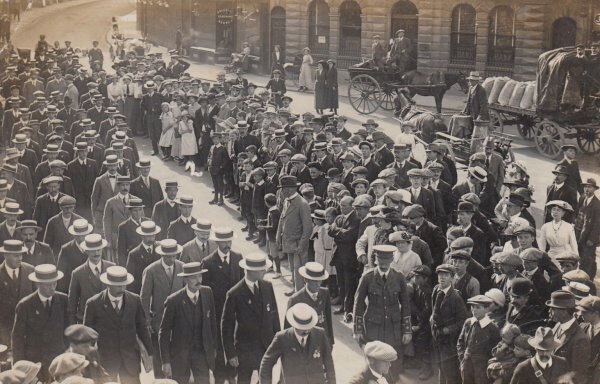 After only six months, they returned to the United Kingdom in March 1900, to mobilize into a new 8th Division going to South Africa which was in the middle of the Second Boer War. The regiment's only action was a skirmish at Biddulphsberg, alongside the 2nd battalions of the Grenadier and Scots Guards. It then served in Ceylon, Hong Kong, Singapore, Peshawar and Multan before the outbreak of the Great War. In the autumn of 1907, at Dorchester, Frederick married Jessie Josephine Palmer (b1883). They set up home at 106 Park Street and were to have two children; Ellen Olivia (1908-1997) and Douglas Frederick (1918-1977). It is likely that Frederick had left the Army by the outbreak of war but, being on the Reserve List, would have been recalled in August 1914. Indeed, he re-enlisted at Yeovil, joining 4th Company, 8th Divisional Train, Army Service Corps as a Saddler, rising to Corporal Saddler. His Service Number was TS/3016 (the 'TS' indicating Transport). The officers and men of the Army Service Corps were the unsung heroes of the British Army in the Great War. Soldiers cannot fight without food, equipment and ammunition. They cannot move without horses or vehicles. It was the ASC’s job to provide them. In the Great War, the vast majority of the supply, maintaining a vast army on many fronts, was supplied from Britain. Using horsed and motor vehicles, railways and waterways, the ASC performed prodigious feats of logistics and were one of the great strengths of organisation by which the war was won. At peak, the ASC numbered an incredible 10,547 officers and 315,334 men. Each Division of the army had a certain amount of transport under its own command, known as the Divisional Train. It was the ‘workhorse’ of the Division in terms of carrying stores and supplies, providing the main supply line to the transport of the brigades of infantry and artillery and other attached units. It initially comprised 26 officers and 402 other ranks of the Army Service Corps, looking after 378 horses, 17 carts, 125 wagons and 30 bicycles. These comprised a headquarters and 4 Horsed Transport Companies (one for each infantry Brigade and one for Divisional HQ and other troops). The Train moved with the Division. In all, there were 364 ASC Companies of this type. 1915 - The Battle of Neuve Chapelle, the Battle of Aubers, the action of Bois Grenier (a diversionary attack coinciding with the Battle of Loos). 1917 - The German retreat to the Hindenburg Line, the Battle of Pilkem+, the Battle of Langemarck+ (the battles marked + are phases of the Third Battle of Ypres). 1918 - The Battle of St Quentin**, the actions at the Somme crossings**, the Battle of Rosieres**, the actions of Villers-Bretonneux** (the battles marked ** are phases of the First Battles of the Somme 1918), the Battle of the Aisne, the Battle of the Scarpe (a phase of the Second Battle of Arras 1918), the Final Advance in Artois in which the Division captured Douai. On 5 November 1918, Frederick was taken to the 7th Canadian General Hospital, France, suffering from bronchial pneumonia. He died there on 7 November 1918, just three days before the Armistice. He was 40 years old. 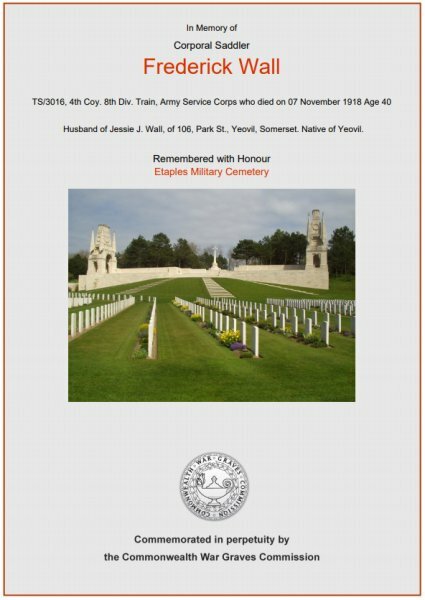 The Western Gazette, in its edition of 29 November 1918, reported "Mrs F Wall, of 108 Park Street, Yeovil, received the sad news on 11th November, that her husband Corporal Frederick Wall, of the A.S.C., was taken to hospital suffering from bronchial pneumonia on the 5th, and died on the 7th at the 7th Canadian General Hospital, France, and was buried with full military honours in a cemetery at Etaples. Corpl. Wall, who joined up at the outbreak of war had been in France four years, and in a letter to Mrs Wall his Captain says, “I should like to tell you what a great loss it has been to us all, as your husband was one of the most popular men in the Company. Since I have had the honour to command this Company, I always found him a good, willing and cheerful worker. On many trying occasions that we have all been through together, he has always been to the fore with cheerfulness and good work, and in addition always set a splendid example to all of us in showing absolute fearlessness in the face of danger, and by doing so has rendered very valuable service in helping the Company out of many tight corners.” Mrs Wall has also received two letters from the matron and nurse at the hospital, and a message of sympathy from the King and Queen. The deceased leaves a widow and two children, for whom much sympathy is felt. Mrs Wall wishes to thank the very kind friends who have expressed sympathy with her in her sad bereavement." Frederick was interred in Etaples Military Cemetery - Grave XLIX.E.8 - and his name is recorded on the War Memorial in the Borough. The entry in the register of recruits to the 97th (Earl of Ulster's) Regiment of Foot, showing No 3490 Frederick Wall enlisted on 28 September 1892 at Stratford. Born in Yeovil, Somerset, his religion was Church of England. Frederick was aged 18 and was 5' 5½" tall. 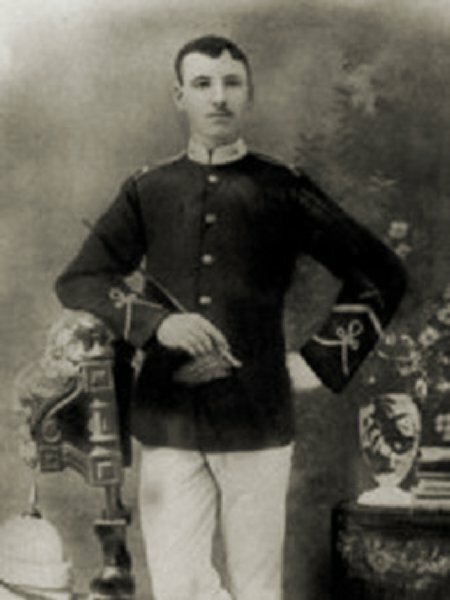 Frederick Wall, probably photographed around 1900, wearing his 2nd Battalion, Queen's Own (Royal West Kent Regiment) uniform. The Commonwealth War Graves Commission certificate in memory of Frederick Wall. 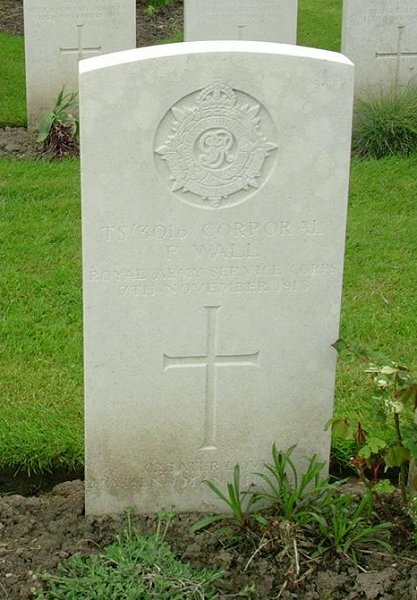 Frederick Wall's Commonwealth War Graves Commission headstone.